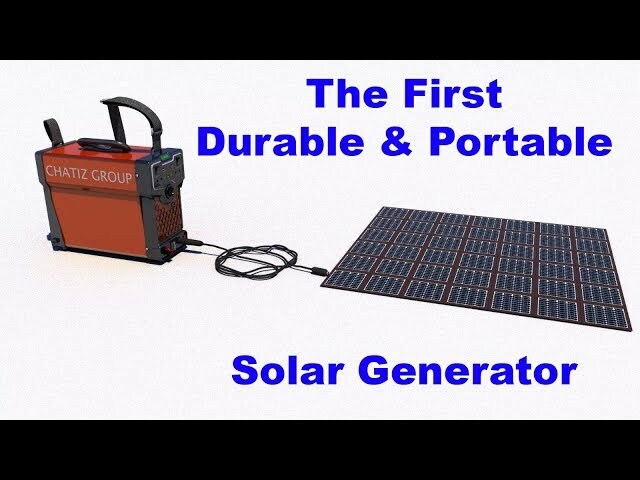 battery-free solar generator that produce electricity for a house with no access to electricity and of course it a lightweight and portable product which you can carry it everywhere. For those who have no access to electricity especially in African countries. As well as those who want to lower their power consumption. 1- In remote and deprived regions that have no access to electricity, expenses of building a power plant or planting utility poles is too high. Using this invention, by only purchasing the device, power for a whole house can be produced at affordable price. 2- This system is much cheaper and more affordable compared to today's solar systems that have become popular in many states in the United States. For example, to launch an on-grid solar system in California State for 3000watts, it costs between $8,000 to $12,000 including the cost of installation, but with $2000 you can buy a system that is even better than today's solar systems and you don’t have to pay for installation the system. It means you can do it yourself. You just need to plug the solar input into the device and start using it and most importantly, it is portable and you can carry it everywhere. 3- With introduction of electricity to rural areas, especially African countries with no access to electricity and light, civilization and health education will also grow directly. This has a major effect on flourishment of the people of these regions. 4- All the environmental problems that are caused by producing, storing or recycling batteries are eliminated completely because there are no batteries used in this invention. 5- There’s no need for fossil fuels to produce electricity with this invention. Because now, sun (an unlimited source of energy everywhere on earth) can be used to produce electricity. Therefore, millions of liters of gas and diesel can be saved daily. This means billions of dollars worth of economical savings and a way to stop polluting the environment. 1- It is lightweight and portable: This system could actually be used on a construction job site on sunny days or could be used for camping or homes with no access to electricity. 2- It is much cheaper and more affordable than today's solar systems: It costs about $2,000, but its capabilities are far more than today's solar systems. 3- The system does not need to use the battery during the day: the weight of the device has been greatly reduced due to the lack of battery usage. The entire 3000 Watt device is only 12 kg and is easily portable. 4- In this system, by using a smaller number of panels, a large amount of electricity is extracted, which is an advantage over today's solar systems. This means that there is no need to install panels on the roof and you can easily spread it anywhere. So the installation costs will be eliminated from the entire system. And it does not require special expertise and anyone can use it. In other words, the device is very simple and functional, and anyone can use the device. Just plug the cable into the solar input and start using it. 5- Using these ultra capacitors in the device, high amounts of energy can be stored momentary and this an advantage compared to batteries. While batteries and capacitors have similarities, there are several key differences. The potential energy in a capacitor is stored in an electric field, where a battery stores its potential energy in a chemical form. The technology for chemical storage currently yields greater energy densities (capable of storing more energy per weight) than capacitors. However, when a battery is discharging it can be slower than a capacitor ability to discharge because there is a latency associated with the chemical reaction to transfer the chemical energy into electrical energy. A capacitor is storing the electrical energy directly on the plates so discharging rate for capacitors are directly related to the conduction capabilities of the capacitors plates. A capacitor is able to discharge and charge faster than a battery because of this energy storage method also. So as long as the sun shines continuously, we will have continuous electricity. The voltage output of a supercapacitor declines linearly as current flows. While other differences exist, batteries and capacitors do have some overlapping applications. However, in general batteries provide higher energy density for storage, while capacitors have more rapid charge and discharge capabilities (greater Power density). Supercapacitors are even safer than batteries. Instead of the chemicals that make batteries difficult to manage, supercapacitors use a sort of static electricity for storing power. That means their performance is more predictable, their materials are more reliable and less vulnerable to temperature changes, and they can be fully discharged for safer shipping, but there are some restrictions on shipping batteries. supercaps excel in this, with a charging time from 1 to 10 seconds, compared to 10 to 60 minutes to reach a full charge on a battery. Typical batteries have 500-1000 charge-discharge cycles while supercapacitors can reach up to one million cycles. First of all, the system is cheaper than the other products. Our system is priced at around $2,000, but the other systems like Tesla system (Power Wall) costs $15,000. Tesla system is heavy and not portable, but it's portable and can be used everywhere. In the Tesla system, the company specialist does the installation work, but in this system, you can do all the work yourself. In this system, by using a smaller number of panels, a large amount of electricity is extracted, which is an advantage over today's solar systems like Power Wall. Using ultra capacitors in the device, high amounts of energy can be stored momentary and this an advantage compared to batteries which be used in today’s solar systems like Power wall. What is the current status of your product or service? We are making the final prototype for mass production. How do you plan to get customers? How will your business make money? And how much money could it make? We are going to launch our crowd-funding campaign within next 3 months and we are pre-selling the product worldwide. We expect to raise $1M in less than a month. If you are successful, what will cities look like in 10 years? There will be no place on earth in the next 10 years without electricity. Because we are still developing and working on new ideas in the energy basin, we believe that in the next few years energy problems will be resolved in general.